We are a Columbia Teachers College Reading & Writing Project School. Bronx Delta is fully committed to successfully implementing the Common Core Learning Standards for the 2016-2017 school year. Together with our parents and highly qualified and dedicated staff, we will engage all of our students in rigorous learning activities and tasks. 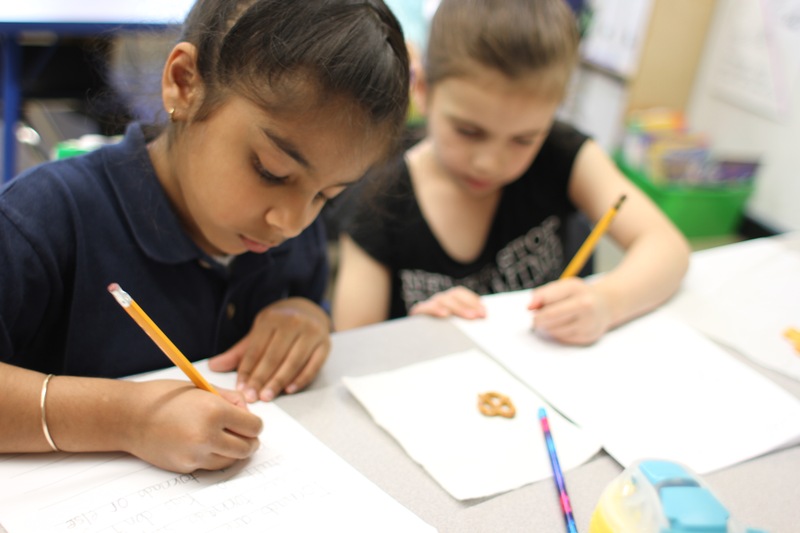 Our academic and enrichment curriculum is designed with well-crafted instructional units and appropriate supports that are also fully aligned to meet the needs of all students. Students participate in the workshop model for reading following a balanced literacy approach. It is an authentic literature-based approach designed to explicitly teach students strategies to comprehend text at their own levels. Reading units of study are designed by the Teacher’s College Reading and Writing Project and then customized by the teachers at Bronx Delta to focus on the strengths and needs of each individual student through whole class lessons, small group work and 1:1 conferring. Student engagement and the interaction between the reader and the text is extremely important and is practiced through close reading of small group and whole class novels. A variety of assessments will be used to help students target individual reading goals, as well as identify students in need of review or enrichment. The Writing Workshop model will be used daily in our classrooms incorporating Teacher’s College Units of Study aligned with the Common Core Learning Standards (CCLS). Our students will work on mastering the writing process to write in a variety of genres. All grades will focus on the three genres outlined in the CCLS- narrative, informational and opinion. Additional units of study may include fairy tales, authors as mentors, fiction, literary essays, journalism, and poetry depending on the grade level. Exposing the students to different genres of writing will help them to become more confident in their writing abilities. Writing conferences, pre and post unit assessments and teacher observations provide daily data for teachers to customize instruction for each of our students. Wilson Fundations – (Grades K-2) is a phonological/phonemic awareness, phonics and spelling program for the general education classroom. Fundations is based upon the Wilson Reading System® principles and serves as a prevention program to help reduce reading and spelling deficiencies. Fundations lessons focus on carefully sequenced skills that include print knowledge, alphabet awareness, phonological awareness, phonemic awareness, decoding, vocabulary, fluency, and spelling. Critical thinking, speaking, and listening skills are practiced during Storytime activities. Furthermore, targeted small group intervention is available. This year we will continue to focus on problem-solving strategies. It is essential that the students are familiar with giving a verbal/written explanation for their thinking and to support their answers or solutions. We utilize the Go Math! program during math instruction. This program is designed to meet the CCLS standards. You will notice that the children are required to write and strategize. In addition to the traditional textbook experience, the students will have opportunities for SmartBoard interactive instruction, computer review and reinforcement activities for home and school, as well as center activities and other project-based learning opportunities. The Social Studies and Science curriculum is taught by following the New York City Scope and Sequence and Common Core Learning Standards. Essential Questions are explored using an inquiry and project-based approach to support and facilitate each of the grade-specific topics. Text & trade books are used to teach and reinforce grade-appropriate concepts, research & geography skills. In addition, students are encouraged to read informational text and other literature independently to deepen their understanding of Social Studies and Science concepts. We encourage families to visit your local library with your child to support the work we are doing in school.